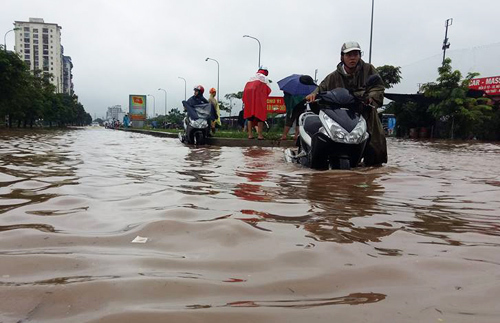 HA NOI (VNS) — Flooded streets, traffic jams and chaos were seen in many streets of Ha Noi this morning, following torrential rainfall of up to 200mm that started at about 8pm yesterday. The districts of Hoan Kiem, Long Bien, Hoang Mai and Nam Tu Liem suffered the most. Long Bien received about 207mm of rain, while Hoan Kiem and Hoang Mai received 190mm and 164mm, respectively. 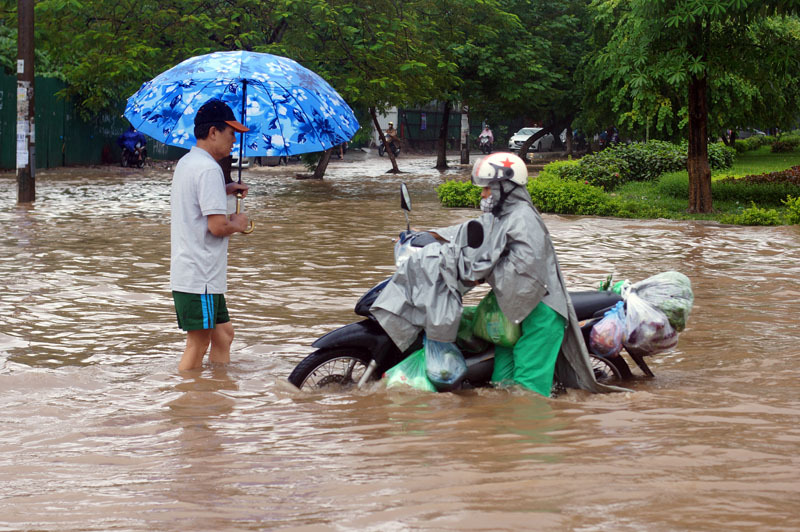 A report by the Ha Noi Sewerage and Drainage Co Ltd said Nguyen Son and Co Linh streets in Long Bien District were inundated by water levels rising to 50cm to 60cm by 9am today. 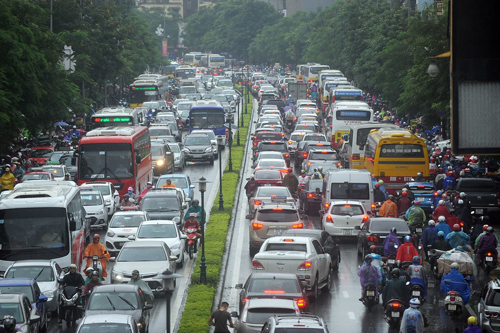 There was a 5km-long traffic jam extending from Nguyen Van Cu Street to Chuong Duong Bridge in Long Bien District. Traffic policemen were sent to fix the problem. Traffic jams also hit Hoang Mai District's Dinh Cong Street, where there was chaos for hours. 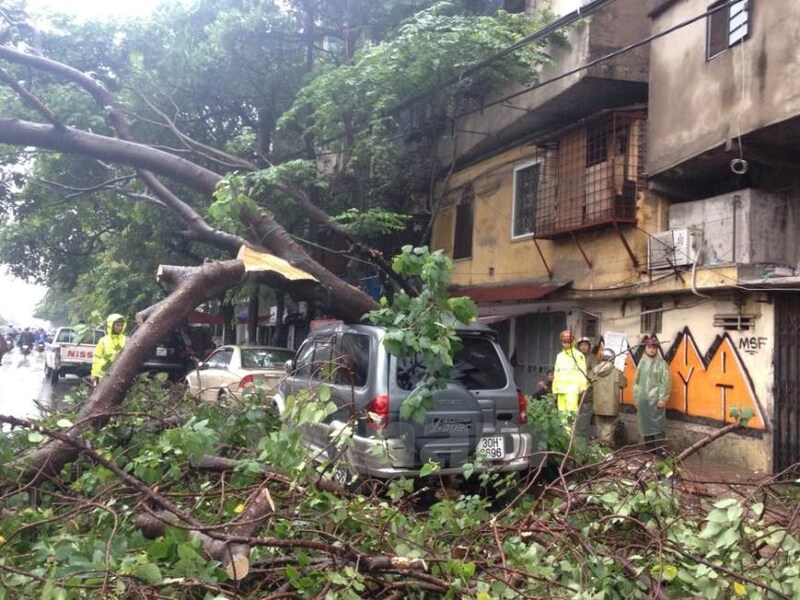 A seven-seater vehicle was crushed after a large tree was uprooted and fell on it in Hoan Kiem District's Tran Quang Khai Street this morning. The sewerage and drainage company has mobilised all its resources to deal with the flooding. All pumping stations, such as Yen So, Dong Bong 1 and Dong Bong 2, in the city were running at full capacity.